Having had three weeks off preaching for various readings, I was back in the pulpit again last Sunday. What does it feel like to be able to buy absolutely anything you want, no matter the cost, and not to have to worry about whether you can afford it? Presumably Chris and Colin Weir have some idea of what that feels like, having just scooped the £161 million jackpot on the Euromillions lottery a couple of weeks ago. They can buy pretty much anything they like without batting an eyelid. Even a top of the range executive jet would only set them back a few million. Any time they suddenly think “I’d like one of those” they can just indulge themselves and not have to worry about their bank account. I wish we could go back in time and stop John Lennon from being shot and George Harrison from getting cancer and give peace a chance. And somewhere in the list of answers, someone had answered the question “What do you want more than anything else in the world?” with just one word … salvation. Salvation, of course, is something that you can’t buy however much money you may have. And while it is completely priceless it is also completely free. And today’s reading is about salvation – or as Jesus puts it about the kingdom of heaven – and about what lengths you would go to, to get it. People will sometimes go to extraordinary lengths to get what they want. Nine years ago there was an accident on the M25 which closed the clockwise carriageway near Heathrow. People were stuck on the M25 for hours on end – you may remember it. Thousands of people missed their holiday flights and found that subsequent flights were full. They had to wait for a seat. One woman was not prepared to wait. She wanted to go on her holiday so much that she queued for over two hours, so that she could buy a ticket on a flight to Kuala Lumpurat an extra cost of over two and a half thousand pounds. She wanted it that much. How valuable to you is your salvation? How much do you want the kingdom of heaven? In today’s gospel reading Jesus gives a series of parables that describe the kingdom of heaven. And we see Jesus liken the kingdom of heaven to a mustard seed, to yeast, to a treasure hidden in a field, and to a pearl of great price. One thing to note about the way that Jesus describes the kingdom is that he uses four images that would have had negative connotations, negative associations, for his hearers. Mustard and yeast, a man digging in someone else’s field and a merchant. Mustard was a weed that a farmer would want to get rid off from his fields – something to be pulled up and thrown away. Mustard was a particularly pernicious little seed. You wouldn’t notice it in a sack of other seed, and would only know it was there once it was growing and taking over the crop. Yeast is the thing that in preparation for Passover a woman would get rid off – as those of you who have been to our Passover Suppers may recall she had to go through the house and throw away every last piece of yeast. Someone who goes digging in someone else’s field and finds treasure. If you go digging in someone else’s field looking for things, you are a thief. And as for the merchant – well, merchants were held in much the same esteem as used-car salesman or estate agents (apologies to any here) or even I might add, in an effort to be topical, a tabloid journalist. Jesus is saying something quite fundamental about the kingdom by using these images – it is something that transforms, something that takes the ordinary or even the unwanted and despised, and makes it into something wonderful. In the kingdom of God the smallest, the humblest, the most unwanted or looked-down upon person, can become a valued citizen. Each of these parables has much to say to us, and is worthy of a its own sermon. But This morning I want us to think about the two parables in the middle of the reading – the one about the treasure hidden in the field and the one about the pearl of great price. And they both make much the same point. They have been called the parables of joy, because both tell us about joyful people – people who have found something wonderful and are thrilled at the prospect of possessing it. They are about people who found something that they really, really wanted! In the first – the parable of the hidden treasure – a man finds a treasure hidden in a field. That would not have been particularly unusual in those days. They had no secure banks, and people could not lock their doors securely while working in the fields. The best way to safeguard things like gold and jewels was to bury them in the ground – being very careful to remember where, of course. But things happened. A woman might die without ever revealing where she had hidden her money. A man might be called suddenly to fight in a war and never return. Nobody would know where to look for the valuables. And then, sometime later, someone might stumble across the hidden treasure. So a man found treasure hidden in a field. Suddenly he was rich! The rule was simple: the person who found the money got to keep it. 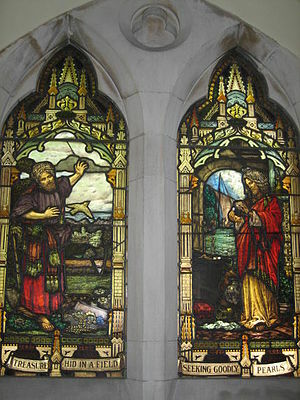 But the person who owned the land might make a fuss – he might think that any treasure found on his land was his to keep – and so the man who found the treasure wanted to safeguard it.Jesussays that this man – “in his joy” – those are the words of the parable – “in his joy” – sold everything that he had to get the money to buy the field. He didn’t ask, “Well, what should I do now?” He didn’t grumble about the inconvenience of selling his possessions. He didn’t hesitate. “In his joy,”Jesussays – “in his joy” he sold everything so that he could buy the field. In the second parable,Jesussays that a merchant, searching for fine pearls, located one pearl of especially great value. Like the first man, he went and sold everything he had to get money to buy the great pearl. 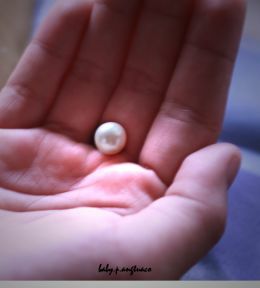 This merchant wanted the pearl so much that he willingly put himself out of business just so that he could possess it. In these stories Jesus was saying that the kingdom of heaven is – like the buried treasure or the pearl – something worth any sacrifice. That is true because, when we are citizens of the kingdom, God is our king. When we are citizens of the kingdom, we are on God’s side. When we are citizens of the kingdom, the king becomes our protector – the one to whom we offer prayers, the one who loves us, the one who provides for our needs. And Jesus says that is worth everything. If you’ve got your priorities right the kingdom of heaven is something that you will really, really want over and above everything else. Jesus’ disciples understood that. He invited them to follow him, and they left everything – home, family, business – everything – to follow him. They didn’t grumble as they followed – well, not much (they were human, after all) – because they felt so privileged to be chosen to follow this wonderful new rabbi. And when the reality sank in after the resurrection, when they knew at last that Jesus had brought the kingdom of heaven, the kingdom of God, to earth, then they served him with joy through often tremendous suffering. And Christians have felt that way ever since – not all Christians necessarily – but lots of Christians – Christians who have caught the vision! Christians who have recognised inJesus something more valuable than anything the world can offer. Christians who have seen servingJesus – and consequently other people – not as a sacrifice but as a joy. Christians who have realised that what they really, really want is the kingdom of heaven – the rule of Jesus Christ in their lives. Which brings us back to that question that I found on the internet: “What do you want more than anything else in the world?” and the person who answered “salvation.” For that is what Jesus offers each and every one of us – that pearl of great price that the merchant bought, that treasure hidden in the field that the man digging discovered, the kingdom – is available freely. How much do we want it? Do we want it so much that we are prepared to give all we have so that we can truly possess it. For the message of Jesus is that the kingdom must come before all else, but that when we put it before all else we shall know true joy in our lives, whatever life may bring us. Jesus says, “The kingdom of heaven is like treasure hidden in a field, which someone found; then in his joy – in his JOY – he goes and sells all that he has and buys that field.” The word of the Lord to us this morning is that he wants us to know that joy – to treasure in our own lives and hearts the life of the kingdom of heaven.